With one of the most original fiction plots, this Roger Corman-directed film has proven consistently popular over the years, perhaps because of its mystical implications. 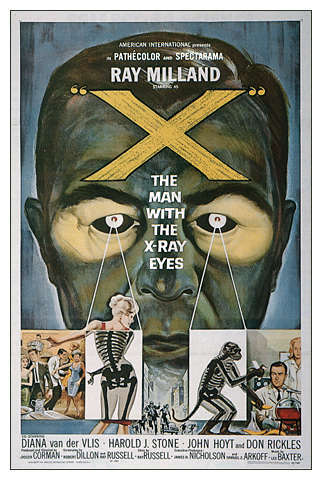 Medical researcher Ray Milland becomes obsessed with the idea of developing a way to see beyond the normal limits of human vision. Colleague Harold Stone warns him, "Only the gods see everything," but Milland persists in experimenting on himself, resulting in successful, and ultimately horrifying, results. Memorable are the scenes when he goes to a party and sees dancing naked bodies everywhere, and the great performance by Don Rickles as a carnie who tries to capitalize on Milland's gift. With Diane Van Der Vila, Harold J. Stone, John Hoyt. * To create the effect of being able to see through a building, the director filmed the construction of the building in time lapse, then ran the film backward.